Frittata's were made to be easy and this one doesn't disappoint. Preheat oven broiler. Preheat oven-safe skillet. Drizzle oven-safe skillet with olive oil. Then spread cooked ham and asparagus in an even layer on the bottom of the skillet. In a different pan, scramble the eggs and add kosher salt and pepper to taste. Then pour the scrambled eggs over the asparagus and ham. Cook oven-safe skillet over medium heat until eggs are set up on the sides of the skillet. 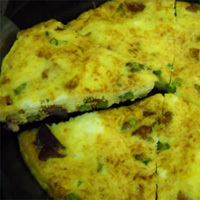 Sprinkle with cheese and bake under the broiler until eggs are set and frittata is lightly browned and fluffy.